Whenever I tell athletes with elbow pain that they might have a UCL injury, I almost always get blank stares. If I mention that this could be a “Tommy John” injury, these athletes seem to understand what I’m talking about. The injury is nicknamed after the famous baseball pitcher Tommy John, who was one of the first to undergo surgery for this injury. His name has now become synonymous with the surgery. Many times a year, you will hear baseball announcers talk about a famous pitcher undergoing “Tommy John” surgery. The ulnar collateral ligament, or medial collateral ligament, of the elbow is one of the major stabilizers of the elbow. It’s located on the inside of the elbow running between the humerus (arm bone) and the ulna (one of the forearm bones). It helps to stabilize the elbow against valgus stress. 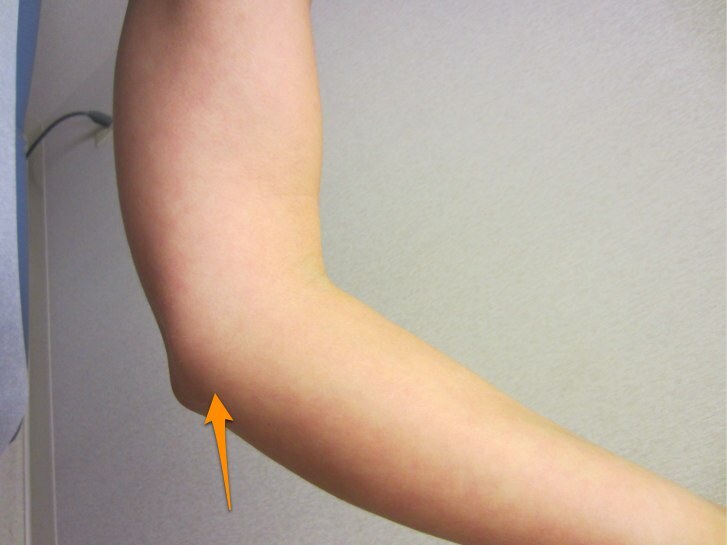 Valgus stress on the elbow occurs when the hand of the throwing arm is pulled away from the body, putting stress on the inside of the elbow. Pitchers and other throwing athletes experience a tremendous amount of valgus stress in the late cocking phase of throwing. This is the position where the shoulder is maximally externally rotated just before the arm comes forward to start to throw the ball. There’s a tremendous amount of valgus force on the ulnar collateral ligament with every pitch or throw. While the muscles of the forearm help to protect this ligament, over time the ligament experiences a tremendous amount of stress. As I said earlier, this is an injury most commonly experienced by pitchers, but it can be seen in many throwing and overhead athletes, such as football quarterbacks, baseball players at other positions, tennis players, and others. Acute events, meaning that there is one particular throw that ruptures the ligament, can occur, but this is usually not the case. This is typically an injury that develops over time. The throwers will usually complain of pain on the inside of the elbow that worsens over the course of the competition. It typically gets worse as the season goes on, and the pain takes longer to go away after each game. In my experience, they often complain of not having the same velocity or “zip” on their pitches or throws, and they often do not feel that they can locate their pitches or throws as well as they used to be able to. A sports medicine physician who takes care of baseball players and other throwing and overhead athletes can usually diagnose this injury. There are a variety of physical exam tests where the physician basically puts stress on the ligament in a variety of positions to recreate the athlete’s pain. While x-rays are often negative, they can show reactive changes and sometimes calcification inside the ligament. Stress x-rays, which are x-rays taken with stress applied to the inside of the elbow to open up the inside of the elbow joint, can also help to demonstrate the injury. Most commonly an MRI, especially one in which contrast is injected into the elbow joint, is used to diagnose the UCL injury. The ulnar collateral ligament (orange arrow) runs from the medial epicondyle to the ulna deep to the flexor-pronator muscle origin. Treatment of a UCL injury depends on many factors, but the integrity of the ligament is the most important. Nonoperative treatment for a complete rupture of the ulnar collateral ligament is notoriously unsuccessful. Rest for several months with gradual return to throwing can be tried, but success in returning to the same level of pitching or throwing is unpredictable at best. A milder strain of the ligament can be treated nonoperatively with better success. Rest from throwing, rehabilitation to strengthen the shoulder and elbow, and even adding core strengthening, working on proper mechanics, and a gradual throwing program prior to returning to pitching can be tried with some success. A complete rupture of the ligament is a very difficult problem. Athletes who are not going to continue in throwing sports might not need surgical treatment. 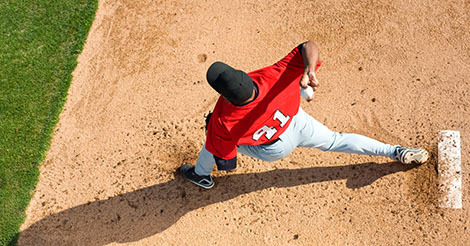 High-level throwing athletes, including college and professional baseball players, are usually good candidates for surgery. There are a variety of different techniques for “Tommy John” surgery, but they are all essentially techniques to make a new ulnar collateral ligament. Typically one of the small tendons in the wrist, either on the same side or the opposite wrist, is used. The tendon is passed through drill holes in the humerus and the ulna to make a new ligament. While the surgery is performed as an outpatient procedure, the recovery and rehabilitation take many months. There is a long rehabilitation process where the athlete works with a physical therapist to increase the elbow range of motion back to normal while avoiding stress on the healing graft. Strengthening is gradually progressed throughout the early phases of the process. Usually somewhere around 4 to 5 months, the athlete is allowed to start a long toss program, but it is usually 6 to 7 months or more before he is allowed to start pitching. In my experience, it is usually about 10 to 14 months before the athlete is able to pitch or throw at the same level of competition he left off. It is not uncommon for the pitcher especially to say that it is his second season back from surgery before he feels that his elbow is back to normal. Do baseball pitchers from warm weather areas have a greater risk for Tommy John surgery? I hear many athletes say that their elbow actually feels stronger after the surgery, although I think that is somewhat misleading. It seems to me that the athletes have experienced problems with their elbow for so long prior to being diagnosed with an ulnar collateral ligament injury that they forget how their elbows felt when normal. In addition, their bodies and their upper extremities are getting stronger, giving them the impression that their elbow is stronger than before. Having said that, most sports medicine surgeons who perform large numbers of these surgeries feel that it is a fairly reliable surgery for getting throwing athletes back to sports, with approximately 90% of throwing athletes getting back to the same or higher level of competition by one year.